Christina Marie Eubanks, 28, of Columbus, OH, passed away suddenly on Wednesday, February 7, 2018. Born January 28, 1990 in Port Huron, Michigan, she was the daughter of the late Vera Eubanks and Joe W. Jones. She was a beloved mother, sister, and friend to many people. Christina was proceeded in death by her mother, Vera Eubanks; grandmother, Maybell Hayes; and niece, Mahogany McChutchen. She is survived by her loving children; daughter, Tylasia Tyler; son, Josiah Eubanks; sister, Ciara Eubanks; sister, Towalome (Malcolm) Hoskins; brother, Joe (Tausha) Jones; and grandmother, Janeaster Miller. Special parents, Tim Tyler and Debbie Pardon Special loved ones, Tyler Jr. and Kelly Bolton. 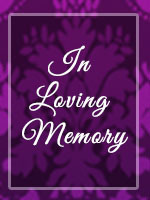 A host of 11 nieces and nephews, 1 great-nephew, aunts, uncles, and cousins who all loved her.